Oasis Mortgage Call (480) 800-3520 to speak with a Home Loan Specialist today! Since 1944 the VA Loan remains one of the few mortgage options for borrowers who don’t have the money for a down payment. Available to millions of veterans and active military members, VA loans are somewhat easier to qualify for than conventional mortgages. Today, these flexible loans remain one of the safest and most powerful lending options on the market. Qualified Veterans and service members can purchase a home without having to spend money on a down payment or private mortgage insurance. All things considered, tons of our borrowers purchase a home without spending anything upfront. But Veterans and active active military members are missing out. The basic intention of the VA Loan program is to supply home financing to eligible Service members, Veterans, and surviving spouses in areas where private financing is not generally available. This was created to honor the service and sacrifice of those in our nation’s Armed Forces. Home ownership is now possible for all Veterans who struggle to secure financing. VA Purchase Loans help you purchase a home at a competitive interest rate often without requiring a downpayment or private mortgage insurance. Stream Line Refinance (IRRRL) allows you to refinance your current mortgage at a lower interest rate than you are currently paying. The IRRRL is available to veterans who want to refinance their original VA Home Loan, and utilized their original eligibility when they purchased it. The key is to make sure military members and their families are aware of the benefits available. In some cases, a VA Loan isn’t always going to be the best solution for a particular borrower. But it should always be an option. Our Veterans need a home. This nation will remain the land of the free only so long as it is the home of the brave. Every veteran has made the ultimate commitment and has demonstrated true patriotism and courage. 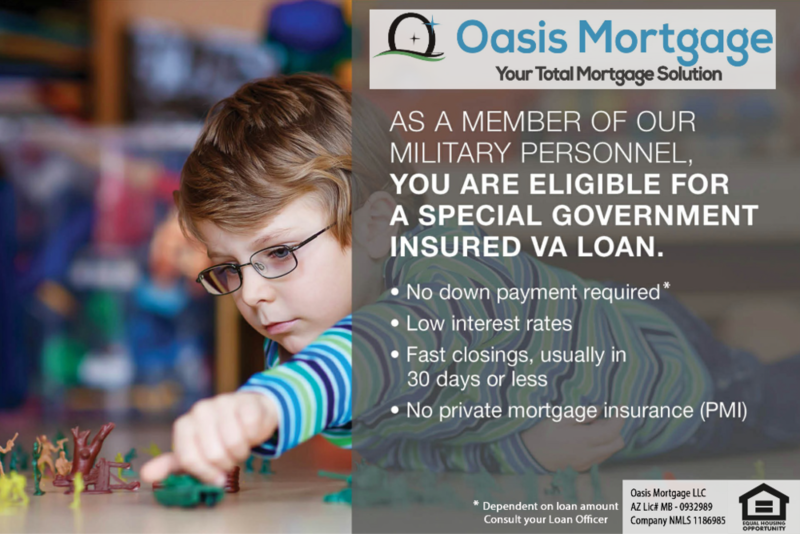 Oasis Mortgage Honors Your service. Speak with a Home Loan Specialist today!